There is a conundrum out there unique to lovers of literature that others might not understand. Might even laugh at. See, we lovers of books want to express and share our love of a good story, and many times this aim is focused directly on our unsuspecting children. The idea of our kids, at any age, having a library of classics is a dream. We want them to be readers like us! And we parents will try every trick in the book to make it happen. So where is the conundrum? I’ll explain it via a story: When I was a child I was given a large collection of illustrated classics. Basically, they were cut-down edited versions of great works for young readers with a black-and-white illustration on the right page; so I was, honestly, being spoon-fed the story. While as a kid, I loved reading these… but there was a cost. See when I was finally at the age to read many of these classics in their original (as the writer intended) form, I really didn’t have a driving need or interest. Yes, by getting an adapted version for the young, the book was ruined for me! Before you toss aside my point as frivolous, consider this, when was the last time you watched a movie adapted from a book and thought I want to read the book now? Ah, now you are getting the point, eh? This is not the first time I tried to throw literature at a toddler. Last year for my daughter’s first Christmas (and for her birthday as well), I picked up three of the Baby Lit books by Jennifer Adams and Alison Oliver. Looking back over the purchases, after the initial excitement of buying a classic book for my daughter passed, all of the good feelings I had about the books that I wrote about in a review (here) left. Yeah, I’m taking back a positive review. Sadly, I now feel these books are a con, a trick of the light, and if it wasn’t for the wonderful illustrations kind of lazy. Yeah, I just called a children’s board book of counting lazy. How? In both their versions of Romeo and Juliet and Pride and Prejudice they count musicians; yes the exact same thing. And in Pride and Prejudice they counted horses. Seriously, that is the best you can do with one of the great works of literature? Horses? Worse, their version of Jane Eyre by Bronte has little of the story in it! If anything these books sadden me now, and I wonder exactly how much the writer actually liked the stories she was adapting, as compared to the money in tricking literary parents like me to buy them. Yet, my love of literature continues and it is holiday shopping time again and for Christmas this year I got my daughter the new book by Jack and Holman Wang (here is the link). 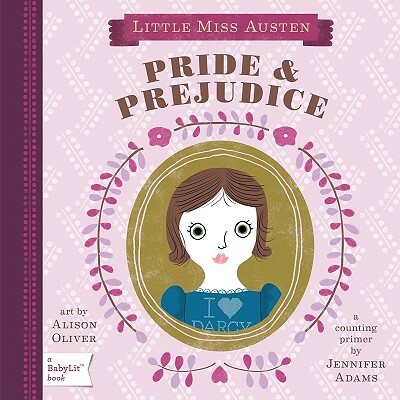 It is a board book in their Cozy Classic series, and it is based on Pride and Prejudice by Jane Austen. So yes, I am in the midst of the conundrum again, but this time the result is happily a little different. So what does this book have over the other board book about Pride and Prejudice? Quite a bit actually. The classic novel is beautifully expressed with knitted characters, and each page shows an example of one word, for example, “Friends,” “Dance,” etc. Young kids can get that, enjoy that! And, it is obvious that the writers care about the story and are fans as well. A relief after the last books. Okay, while I had no problem calling the other versions lazy at times, this one is far from it. For example, in the fourth picture they are able to capture the feeling “mean” with knitted characters…. Emotion… with knitted figures! If I have one complaint with the book it is on the last page. The last page’s word is “Marry.” Yes, it is accurate to the actual book it is based on, I get that, but marriage seems to me a more difficult thing to explain to a one-year old than “dance” or “mean” or “muddy.” If I was to have spoken to the authors I would have recommended the word “happy.” Maybe they will consider making that change in future printings? Children understand the word “happy” and they would have felt it along with the picture. It is definitely a missed opportunity. Please be aware parents, unlike the counting books, this one attempts to follow the plot of Pride and Prejudice, which does return me to my conundrum around doing this to literature. Am I ruining my daughter’s reading of Pride and Prejudice in the future since she is getting this book? Am I honestly being selfish in making this gift? So taking all of these points into consideration do I recommend this to my fellow parents? The parents that, like me, dream of young readers and giant future libraries. Yes, I do, but with a footnote. My footnote: While this holiday, I will give it to my daughter with my blessing, and I am sure I will read it over to her again and again… but when she turns three I will be hiding it away; allowing Ms. Austen her own chance to make a mark later on. I think we all agree that Jane Austen earned that chance. If you liked reading the editorial, why not check out some of my published books? I had two novels published in the last few years, My Problem With Doors and Megan. You can find them via my amazon.com author page here, or as an eBook on Google eBooks here. My new book, A Jane Austen Daydream will be released in December. Thanks for reading! This entry was posted in Book Reviews and tagged adaptations, Alison Oliver, Baby Lit, Board Books, Books, Bronte, Counting, Cozy Classics, Holman Wang, Jack Wang, Jane Austen, Jane Eyre, Jennifer Adams, Literature, Novels, Parenting, Pride and Prejudice, reading, Romeo and Juliet, Toddlers by Scott D. Southard. Bookmark the permalink.